This week’s video cautions against opening with a type of conflict that might initially seem a good idea—and shows you how to figure out the right way to begin your book. Action. You’re supposed to begin your book with action, right? There has to be some sort of tension and conflict and stakes if you’re going to stand any chance of grabbing your readers’ attention right out of the box. That’s been hammered into our heads by every writing book and magazine we’ve probably ever read. And it’s certainly true enough as far as it goes. But what we don’t necessarily find implicit in that recommendation is what kind of action we should start off with. The only true rule here is that whatever kind of action you decide upon, it needs to be interesting. And what’s interesting to your readers will be largely subjective, based on the type of story you’re writing. But today I would like to comment on one of the less effective types of action with which to begin your book—and that is anything involving avalanches, wolves, or lightning. In other words, anything that relies on impersonal antagonistic forces. I recently read a fantasy that started with its characters in a blizzard running from wolves. High stakes, right? There’s action, there’s tension, there’s conflict. The bases are covered. But I—the reader—was yawning. When does it get to the good stuff? When does it get to an interesting interaction between characters? Now this isn’t to say impersonal antagonistic forces are always a bad idea. Indeed, some stories will focus on them entirely. But generally speaking, they’re not a good way to open your story because they don’t provide enough color or context. Readers don’t want to just see your protagonist running or fighting for his life. What they really want is to be hooked by an interesting situation, a little bit of irony, a conflict with an antagonist that raises questions in their minds. 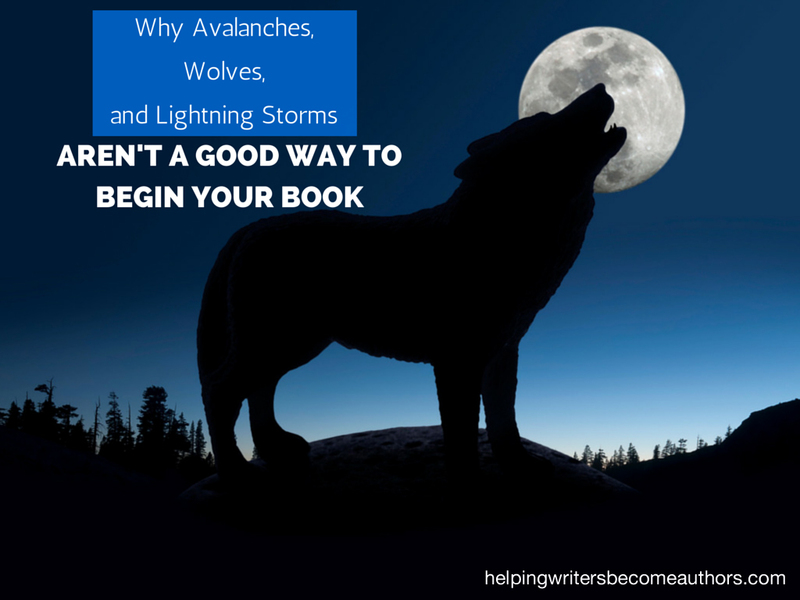 There’s rarely any question about why wolves are attacking or an avalanche is falling. So keep this in mind before you decide on any kind of impersonal action as the best way to begin your book. Tell me your opinion: What do you think is the best way to begin your book? Are You Telling the Wrong Story? This is a good disagreement, actually. White Fang is an excellent example of how to make this “mistake” work because it is a story about wolves. The wolves are a completely organic and necessary introduction to the main conflict. If readers are bored by that opening, then they’re not going to like what follows – and vice versa. K.M. this is a very astute observation about the wolves. And in fact, the wolves themselves are in no trouble at all: just doing what wolves do. I usually like to start a new story with an interaction with a minor character that leads to some sort of interaction with another main character. The minor character tends to be a character that doesn’t reappear, because I like to give my main character a chance to show who he or she really is. An interaction with a stranger usually does that well. I think that it introduces their personality best. I also make sure that this interaction still matters, either in the moment or later on, because really, how disappointing is it when an author writes about something that you catalog away in your brain for later and then never mentions it again? Very smart, re. making the interaction matter. Whatever happens in the opening scene *may* be just a framing device, but it automatically gains importance in the readers’ eyes just from its placement. Good point, too, on using a stranger to show who your MC *really* is. I’m tucking that one away for future use myself!